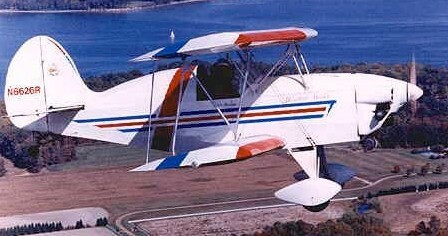 The H-2 Honey Bee is a lightweight aerobatic biplane first flown in 1986. With the H-2, designer Bert Howland introduced the technique of TIG-welding the fuselage from square 6061-T6 aluminum tubing, yielding a strong and rugged fuselage frame that weighs only 24 pounds. The airfoil on the 4 equal span wings is 6-1/2” thick and features 7 aluminum-capped foam ribs per panel with a D-cell leading edge spar and a C-section rear spar. Design load factor is +8g to -6g. The prototype and early versions used engines in the 40-46 horsepower range, but the designer later moved up to an engine of 65 horsepower as standard. The plans provide a two or four aileron option for those who wish a more responsive roll rate. When that option is selected, together with an engine in the 85 horsepower range or better (such as the Hirth F-30), and with an inverted fuel system, the H-2A is suitable for use in competition aerobatics up to the International Aerobatic Club's "intermediate level." 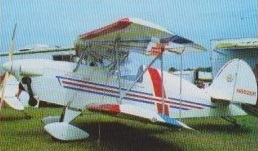 In 1992, an H-2A Honey Bee was named "Best" in the combined Ultralight/Lightplane category during the EAA East Coast Fly-In at Wilmington, Delaware. The aircraft has been powered with engines from 40 to 95 hp. Homebuilder plans cost $250 in 2009 and consist of 40 engineering drawings and designer construction notes. Engine: Hirth 2705, 65 hp. Design load at 550 lbs: +8,-6g.